Try saying that with a mouthful of cake! A dozen boats turned out for the first of the remaining three Seven Stars Autumn series races on Saturday. The first one was cancelled due to weather. Stuart Higgins the Race officer set us a westerly wind course to St Just, W (Rustler Yachts) and return to the turning mark for a second round. 8.4 miles. The wind was brisk by the club and I had contemplated a no 2 genoa. However it was one of those warm winds with reduced density and we flew the no 1 genoa with success. 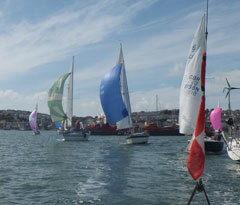 Nine yachts started in U class including my previous Sadler 25 Tomaray, Jonathan Myers, round from Mylor. On Trifle we set for port pole spinnaker and then changed it as the wind backed 20 minutes before the start. On the start the wind had veered again and so we set off on a starboard broad reach under genoa from the clubhouse side. Aurora, Mandy Owens just to windward of us flew a spinnaker on starboard hoist and had to head up before the gybe. We flew a goosewinged main and genoa and slipped down the side of the moorings. Everyone behind flew spinnakers and I thought we would get buried underneath them! However Aurora gybed and established a boat length lead from us as we turned the corner and headed toward St Just. Wilkie, Bob Chapple and Kaimana, Jess & Nigel Rowe were closing up with their spinnakers but the wind went forward of the beam and we managed to keep pace with Aurora and ahead of the fleet. The gybe at St Just then took us toward W and was a good starboard kite for Aurora. We held on and only lost about 5 boat lengths by not hoisting the spinnaker. On rounding the mark we managed to out point Aurora and stay out of her disturbed air. Wilkie came up close to us but fell away in our dirty air forcing them to tack away. We managed to make the moorings corner on one tack and took a sizable chunk out of Aurora’s earlier lead, as she had to do two tacks to our none. The turning mark was rounded and we set off for the second round. A windward kite launch gave us endless problems with the wind oscillating forward and collapsing the spinnaker, It is often better not to fly too shy as it is quicker to concentrate on genoa trim. Thus we doused the spinnaker and rehoisted it on the next leg. We ended up at W with a slim lead over Aurora but again managed to outpoint her and finished 1 minute and 51 seconds ahead. On handicap she took 2 minutes 43 seconds out of us. Three G class yachts started and went around the same course. Katy, Sue Grigg beat Miss Agnes, Mike Rangcroft by 9 minutes with newcomer Scallywag, Andy Platt, third. Thanks to Stuart Higgins and Jeannette in the ops room. Charlotte Jones for the scrumptious tea and cakes. John Maunder for the bar and Giles for bringing us home. Malcolm for processing the results.